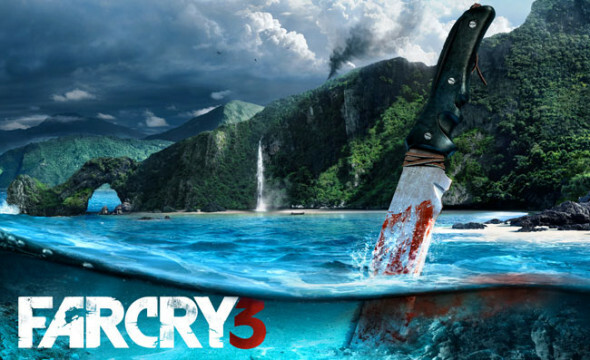 Far Cry 3 must be one of the most hyped titles of 2012. Ubisoft has been getting us in the mood for this exotic cruise to an island filled with baddies for quite some time now. Will this holiday prove to be one we won’t forget? Far Cry 3 is pretty much the story of a vacation gone horribly wrong. The game treats us to a happy intro of young friends and family members having fun on what seems to be an epic holiday. This image gets disturbed quite quickly when you find yourself simply watching this clip while being hostage in an camp in the middle of the jungle on an exotic island. You (Jason Brody) and Craig Brody are being held hostage by the villain Vaas who is simply determined to earn some money out of you and dispose of you one way or the other. During the change of guards Craig gets you loose and tries to escape with you, the whimpering younger brother sticking close to him. However upon doing so you get caught and your brother pays with his life. You however manage to escape and this is where the real story begins. The story will further revolve around how you become a warrior that might be able to free this island from it’s reign of terror, but more importantly it will also be a way to get stronger to rescue your friends and little brother. To aid you in this quest one of the locals, named Dennis Rogers, puts a special kind of Tattoo on your skin which seems to give you extra powers and a sudden boost in confidence aswell. We see our, at first cowardly, protagonist become a ‘Rakyat’ warrior that equals no other. Ubisoft did their best to offer a seperate storyline for those who enjoy co-op play aswell. This story revolves around 4 social rejects (a crooked cop, ex military, …) who got sold out by a previous partner of theirs. A good crew to start a story of revenge. It’s noticeable though that gameplay was more important in this portion of the game. Personally I tried the console version, which looks a little less than the PC version but still looks amazing. During the playthrough of the single player mode of Far Cry we get treated to a vast island filled with loads of details. The Jungle looks great and makes you feel like you’re walking through the plants instead of walking through a cardboard island. The characters tend to be likeable or give you that proper amount of hate to get more attached to the game. Except for random bugs like grass sticking out through bodies or corpses randomly dissapearing right before you’re able to loot them, this game can be easily called a game with a high graphical quality. The soundtrack of the game knows how to keep us in suspense but again on a quite subtle way. You won’t have too much time to enjoy the music, because when relaxing the island will simply throw something new at you that is able to kill you. The voice acting is also a job that has been put some time in to. 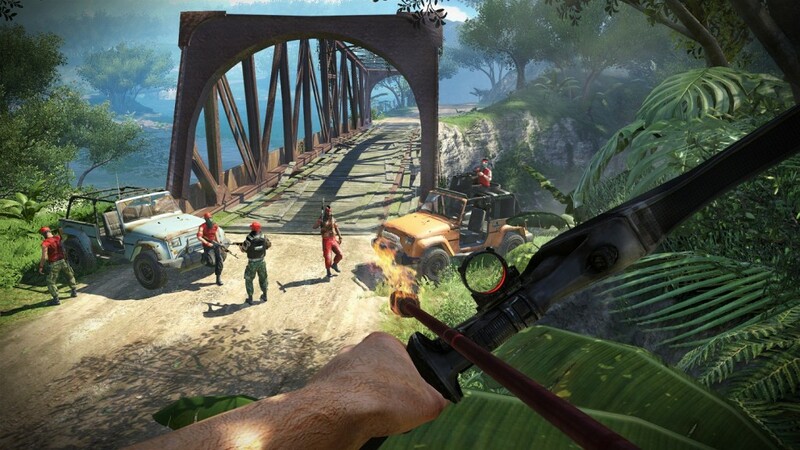 Far Cry 3 is played in the first person view yet offers us so much more. You will play on a fairly large island where you can roam around freely and you will have to, to actually explore all the parts of the map. The map will unlock in small parts after you climb Radio Towers and activate them to your benefit. Which in return unlocks a lot more than an increase in visibility. Climbing towers to unlock portions of the map sounds pretty familiar when we think of another Ubisoft franchise however. The game works with an experience system which allows you characters to level up and choose skills out of 3 different skill trees. Most of these skills will simply make you play the game smoother or give you extra passive abilities like an increase in health, faster reloading, faster weapon switching and so on. Some however unlock new abilities like being able to slide when running or other ways to kill your enemies. Except for actually leveling our character we can also upgrade our gear or craft useable items. To create these items you will have to either harvest plants which in it’s turn can provide you with healing items or items that give temporary boosts or go hunting to collect skins of animals to create bigger inventories, extra pouches for grenades or simply provide you with that bigger wallet to save up more cash for goodies. Outside of the storyline which consists out of missions, the game offers us loads and I mean loads of sidequests. When clearing camps of enemy pirates you will unlock a few simple quests aswell, like hunting or wanted quests. When unlocking the ‘vision’ of parts of the map other quests will also become available like sharpshooting quests, delivery quests etc. Basically you will be able to spend loads of time in Far Cry 3 doing sidequests if you’re like me and want to get stronger before progressing with the overall storyline. Customisation options are also a part of this game. When unlocking weapons you will be able to buy add-ons for some which will surely be a nifty extra and a decent help compared to the standard weapons you find when killing your foes. A multiplayer mode has also been implemented in the game, but I have to honestly say I didn’t try out this mode in it’s full extent yet because the other 2 modes offer a load of gameplay time and will probably be the reason why you should get this game or not. Far Cry 3 might be one of the most hyped games of the years and to be honest it might be one of the best titles of the year aswell. This game will offer you a lot more than a normal first person shooter and will keep you occupied for days, if not for weeks if you go and explore the other modes the game has to offer. A great way to end 2012 and perhaps a great present for under your christmas tree.